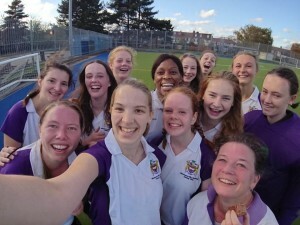 The ladies 2s were awesome! Abbi fulfilled her promise to Sarah of getting a hattrick, and not to be outdone Michelle scored 2, one on the reverse and the other from an impossible angle! Kate followed up with a final goal to finish with our team scoring 6. The other end had a couple of mix ups *ahem* Lisa and Pippa! With juniors Caitlin and Romy clearing up their messes alongside Freya in goal. An excellent win from a team who go from strength to strength each week and are a pleasure to play with and watch ? WHEHC Ladies 1s arrived nice and early at Aylward on Saturday for our 10:30am derby game against Southgate 3s. The game started really well in our favour with WHE ladies running rings around the Southgate players. Pretty quickly we got our first goal on a break by Helen Fenning who got past several players before passing to Beth Deane who took on the goalie. The first attempt failed to result in a goal, but Beth beautifully followed up and slotted the ball into the back of the net putting us in the lead. Soon after we got our second goal which put us 2-0 in the lead – Caroline Briers intercepted the ball from a Southgate free hit, passed to Beth who scored. Half time came and we were still 2-0 up – amazing! However, our concentration lapsed significantly in the second half and despite some good play with great one-twos, movement off the ball and Bethany McNamara doing the bounce the ball over the stick thing from training, Southgate managed to get three goals past us. Beth came very close to getting a hattrick, just missing getting us an equalising goal! DOTD – Karen Gray for slipping over several times, just beating Bethany who dropped her stick several times! A late game at 16:30 away always makes squad numbers difficult. However, we had 12 despite someone crying off with a dodgy gut! It was typical Blueharts – late running games and little warm up time made available. Despite this Winchmore made a strong start. We dominated most of the play with the opposition limited to breakaways which were mainly snuffed out. There was good work on the ball throughout including Rafi who showed hunger for the ball and used it well. We finally fell back on our stalwart Tim Mall to break the deadlock – a typical jinking dribble and fine finish to make it 1-0. Blueharts did threaten by gaining several short corners. They didn’t seem to have much firepower but were given the chance when a foot was adjudged to prevent a goal. Penalty flick. While we considered how to get ahead again, Nick Smith answered for us by saving and keeping our one goal lead. This was the pick of Nick’s MOTM performance, and Adam Machray struggled through valiantly despite an injured leg. Unfortunately, we did concede before the break, making it 1-1 at half time. The defence remained strong in the second half with Jim Gatting and Mike Dutnall in particular frustrating their forwards. We had a number of short corners but couldn’t convert this week with their keeper also having a good game. Stuart Carrick politely asked the chap who had once tried to wipe him out and later hit him on the back of the head with a stick to grow up, but he just couldn’t. Carrick got a green along with the opposition player. Winchmore continued to press until the end but Blueharts dodged the bullet of a loss. To cap it all off the floodlights were turned off before we had collected our kit leaving the pitch in darkness! We found our stuff and accepted we could have had 3 points, but we’re pleased with the performance and are starting to string together a small unbeaten run. DOTD: Stuart Carrick – green card! The men’s 2s faced Broxbourne in the late 16:30 pushback with Peter Morton, 13 year old Tej Mody and young goalkeeper Tiernan all making their debuts. The opening minutes of the game were even with both sides sharing possession. Winchmore looked organised with good interplay between the attackers and Huw marshalling the defence. Broxbourne got the breakthrough pulling the ball across the D allowing for a close-range finish. Broxbourne doubled their lead with a strong hit towards the bottom right of the goal. Goalkeeper Tiernan, making his Winchmore debut, was unlucky as his athletic save tipped the ball onto the post and in. In the final 10 minutes of the half Winchmore appeared to get a hold of the game and were relentlessly attacking the opposition goal. Several good saves from the keeper kept the score at 2-0 however Winchmore’s persistence was about to pay off. The ball was hit into the top of the D to the target man Chris Buff who deflected the ball leaving it rolling towards the Broxbourne keeper. For a still unknown reason, the defender marking Buffy screamed at the keeper to leave the ball… the keeper duly obliged and Winchmore were left celebrating. As the half time whistle blew, despite being 2-1 down Winchmore were applying pressure to the opposition and remained confident. As the second half began Winchmore started where they left off with Dom and Stan feeding the attackers, allowing Jude, Asher and Buffy to create several good chances. A flurry of short corners all unfortunately resulted in some more athletic saves by the Broxbourne keeper. The score eventually finished 4-1 to Broxbourne which did not reflect the closeness of the game – the difference being the oppositions clinical finishing. However, lots of positives to be taken from the game. MOM: Huw Thomas – Growing in confidence every game and a very organised performance in the heart of the defence. DOTD: Robert Ulph for getting lost on way to ground and heading the ball during game.